First, let me pour you a steaming cup o' tea. And then you can read my quick follow up on the Popovers we made last Saturday -- since some of you were wondering how they turned out. You will recall this was my very first attempt; I didn't even know what popovers were until I did some online research. In one word, the popovers were #YUMMY! Turns out, rather than baking the popovers at our house as first planned, we took the prepared batter to our friends' home for our spontaneous Afternoon Tea Party. We didn't want the popovers getting cold and falling in the middle like a broken souffle. With the oven already pre-heated to 425F when we arrived, it only took a moment to have the muffin pans greased and batter poured in. While they baked, we put our hands to slicing ripe pears, filling the glass bowl with Saskatoon jam, and grating a bit of cheddar cheese we just knew would m-e-l-t wonderfully into the anticipated warm, hollow middle. Note: We used muffins pans as neither of us own popover baking pans, which I understand are narrower and taller, and give the finished popover a fluffier, airier lift. People who use the real thing seem to swear by them -- they say you cannot experience a real popover in all its true fluffy lightness using muffin tins. No doubt they are right. Although our popovers look a little flat, more like muffins in shape, they did not taste or look like muffins on the inside. For, when we broke them open there was that soft, hollow inside just waiting for slathers of butter and jam -- and they tasted somewhat like a dutch skillet pancake (which I love). We all numm-nummed our way through the whole batch, and I cannot image why I didn't double the recipe ... for, even though they weren't baked in the 'proper' popover pans, we were definitely wishing for more. And, we might have to ask the Birthday Fairy for some real popover bakeware for next time. - roast beef or turkey, with gravy, in place of the traditional Yorkshire Pudding. In case you are also wondering, from the list of three I shared in my earlier post, I finally chose the recipe from Growing Up Julia. She provides optional ingredients -- we did not include them this time. Popovers are so simple, easy, and quick. And don't forget, yummy! 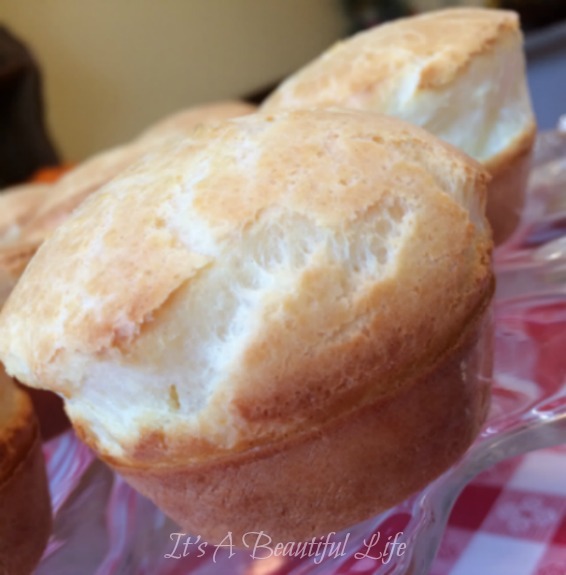 Four great reasons to have a popover recipe to your collection. "It's fun to get together and have something good to eat at least once a day." and invite someone to share this yummy pleasure with you. Wishing you a pleasant day and a beautiful weekend ahead. Any recipe of Julia's is sure to be good. They do look yummy! 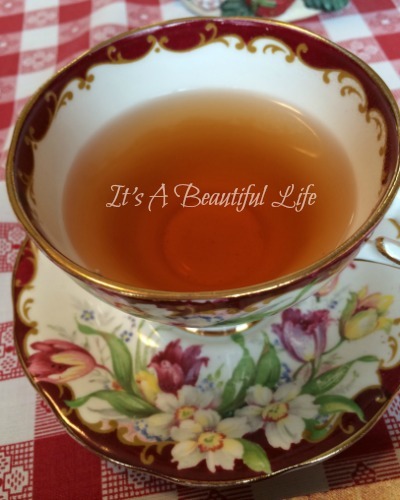 LOVE your opening photo of the teacup with you blog name on it! I have never made popovers either but dearly love all the stuff you eat them with or put on them so I will have to give it a whirl! 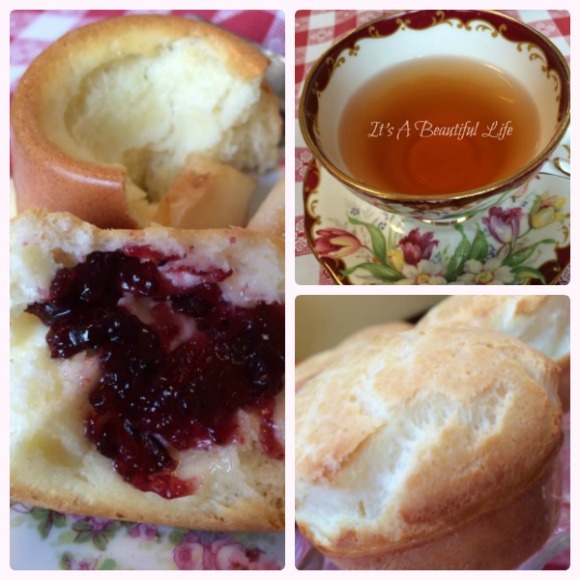 They look yummy, and what fun to have a popover impromptu tea party. From what I understand further about the difference between Yorkshire pudding and popovers is that the former uses the meat drippings as the grease and the popovers use butter. Otherwise it seems the recipes everywhere are similar. Everyone has their own theories about how to bake and at what temperatures. So, I think the best thing is to sort it out to your own liking, and then enjoy! Thanks to my dear beautiful friends for leaving comments and sharing your ideas with me. You always make my day sweeter! 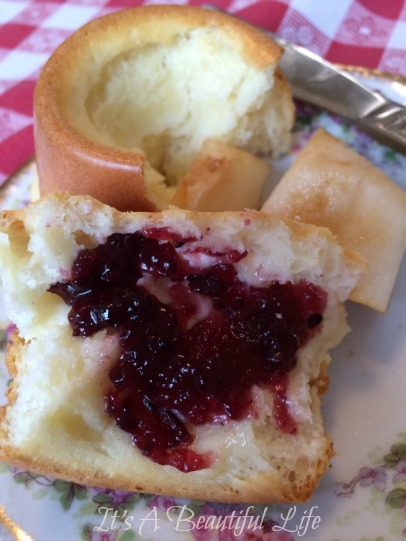 Brenda: So enjoyed reading about the popovers and it brought back many memories. My Mom and my Grandmother used to make them. I remember thinking they were a grand treat. My mom would serve them with butter and honey and my grandmother would put out her blackberry jam when she made them. Just wonderful however they are served. Thanks so much for reminding me of popovers! I've never had popovers before, but hope to try them one day. 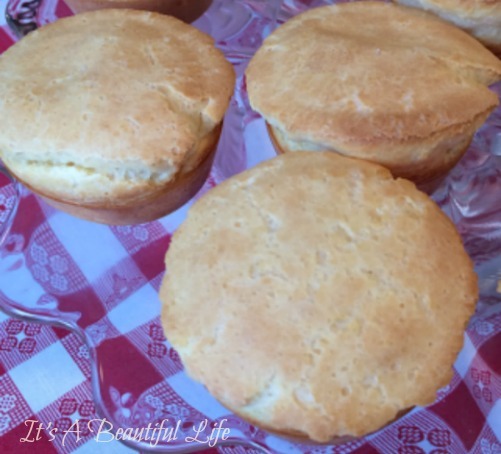 Thanks for sharing these yummy images, Brenda! Your pictures are beautiful and make my mouth water. How fun to go over to your friend's home and share in the preparation, baking, and eating! So happy to hear these turned out so well. I do think you should get popover pans if this is to become a regular feature on your tea table. I'm looking forward to making some soon! Mmmm. Your popover options has me hankering for some slathered with butter and dripping with pure Alberta honey! We buy it in gallon pails when we're out visiting family, and it's oh, so delicious! Glad the popovers turned out - they look scrumptious. I'll never forget the first time I met a popover, when I was a little girl going to brunch with my grandma at her friend's house in the hills east of San Francisco Bay. They made a huge and favorable impression on me, so that when I had a house of my own I very soon got in the habit of making them myself. It's like magic to make something so special from simple ingredients and a straightforward method. Hmm...maybe today! I have made popovers and they are very much like my Yorkshire pudding. Like you said, Yorkshires are made with the drippings from your roast but both of these delights are delicious. Yours look fantastic! Thanks for sharing and enjoy your day. By the way, I always use a muffin tin and they always turn out wonderfully. This is great. Thanks for sharing. I recently bought pop over pans, so this is perfect timing.